“Healthy desserts.” Let’s be honest for a second: I’ve tried making a lot of healthy and healthy-esque dessert recipes at this point, and I’m convinced that they’ll just never be as good as the really decadent stuff they’re supposed to replace. Because, surprise! other fats don’t taste as good as butter, other sweeteners don’t cut it when compared to sugar, etc. Since I do have a sweet tooth, but don’t want to “splurge” every time I crave something sweet, I try to work with what I’ve got by making something that hits the spot without sabotaging my otherwise healthy day. So if you’re looking for a recipe that rivals key lime pie or chocolate chip cookies in its delectable sweet treat power, I’ll level with you—this is probably not gonna be it. But if you’re looking for a really good low-sugar, low-carb dessert option, then I highly highly recommend these Sweet Coconut Milk Bars! Inspired by a recipe from a great blog called Living Healthy with Chocolate, these are creamy and rich and just sweet enough to do the trick, with a bunch of nuts and very little added sugars. Good stuff. I’m looking at you, New Years Resolution-Makers! First, get the sweetened condensed coconut milk going. 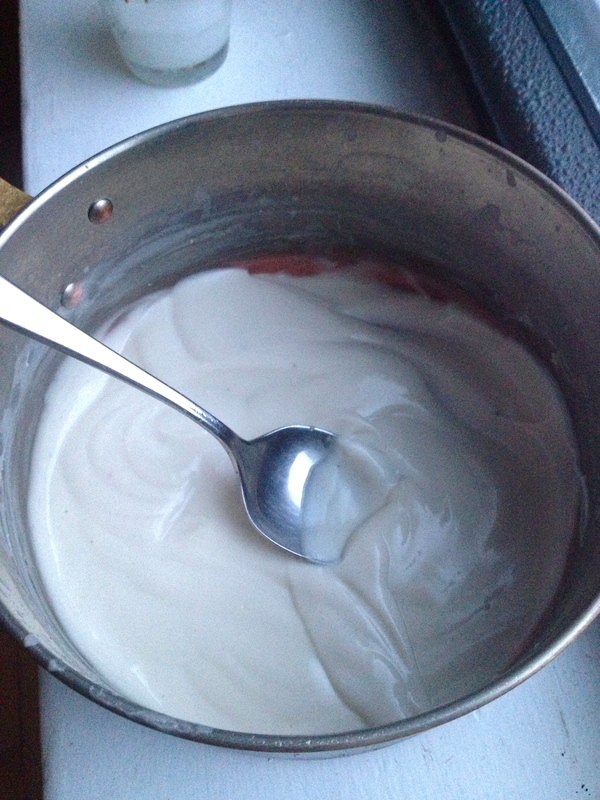 Empty the can of coconut milk into a sauce pan and stir in the honey. Bring to a boil, stirring pretty consistently, and then reduce to a mellow simmer. Stir occasionally and cook for about an hour and 15 minutes, until the mixture has reduced by half and has darkened slightly in color. It should coat a spoon thickly and be the consistency of gently whipped cream. To prepare the crust, first preheat oven to 350 F. Mix together ground walnuts, almond meal, vanilla extract, butter, and cocoa powder. Line a small baking dish with parchment paper and transfer the crust mixture to the dish. Use your fingers to press the crust into a thin layer that covers the bottom of the pan. Bake for 5 minutes. 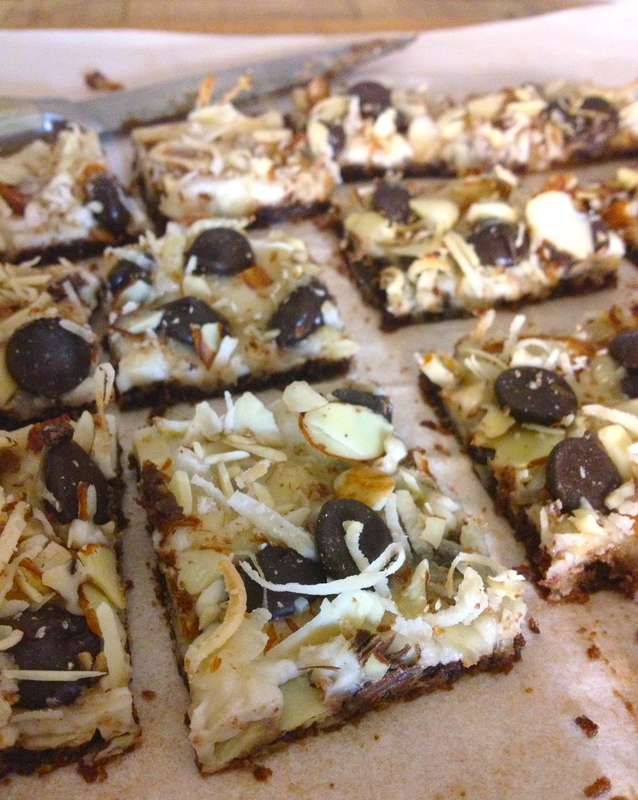 To assemble the filling, mix together the almonds, shredded coconut, and chocolate chips. 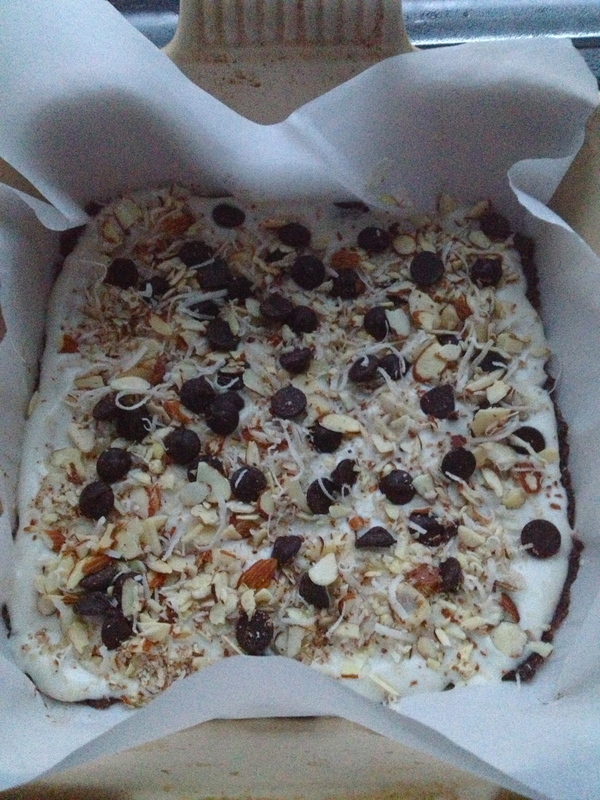 Spread the condensed coconut milk over the crust and sprinkle the chocolate chip mixture over the top. Bake for 15 minutes. Take the bars out of the oven and carefully lift the parchment paper up and out of the pan and set it on a wire rack to cool for one hour. Then transfer to the refrigerator. Let them set in the fridge for at least an hour before cutting into squares. To make sure the squares hold their shape and don’t fall apart, keep them refrigerated. Previous Glazed Apple Bundt Cake. Next Creamy Chocolate-Coffee Tart with an Almond Crust. Ooo I didn’t think of that, love it! 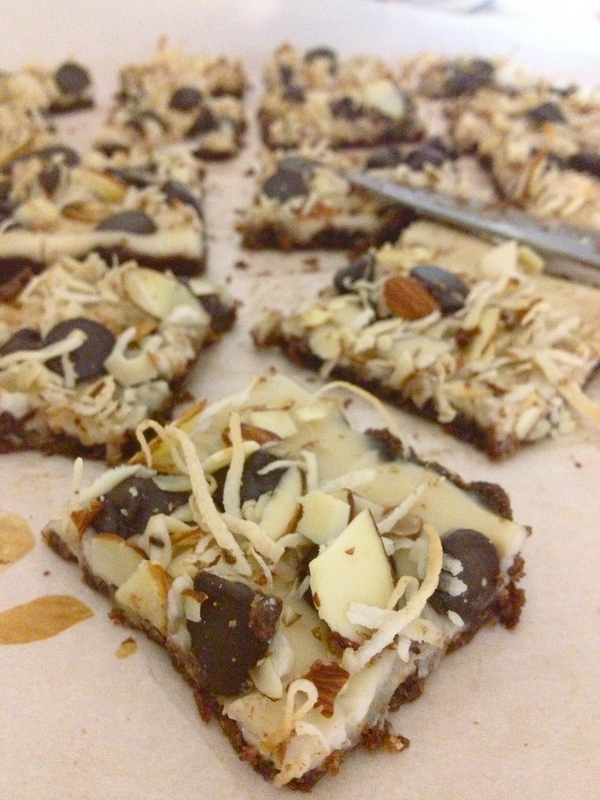 Love the sound of this recipe – would be a good treat for Chris who eats a primarily Paleo diet :) Thanks for sharing! Thank you for telling it like it is about the “healthy desserts” thing. I would much rather have a tiny bite of something decadent than a whole pan of low-whatever brownies. Also, condensed coconut milk: BRILLIANT. What a delicious idea. Since we’re being honest here: I licked the spoon so many, OH SO MANY times while the coconut milk was condensing. It’s totally delicious!!! Did you save me one Kel?